Fast-Moving Wildfires Destroy Hundreds Of Homes In Northern California : The Two-Way The Valley Fire alone has claimed 585 homes and hundreds of other structures since it started Saturday. At least one person has died. 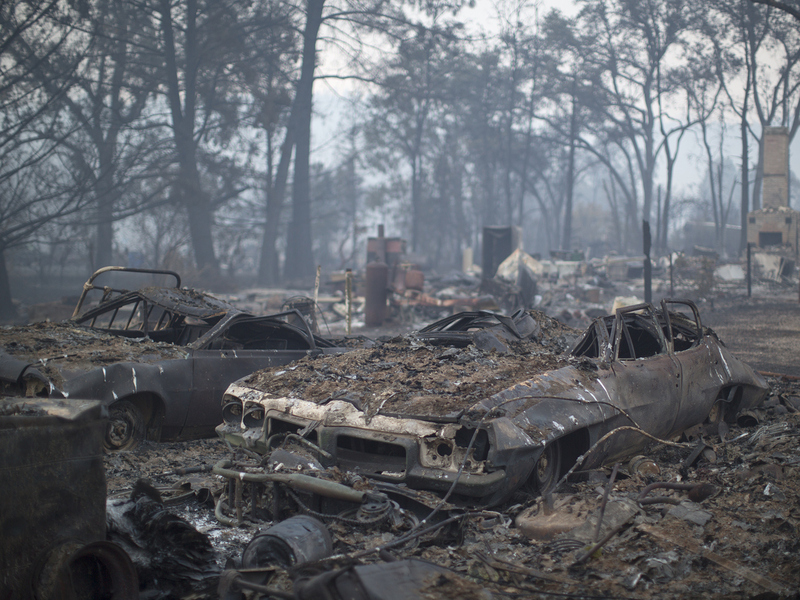 Cars and homes in Middletown, Calif., lay charred by the Valley Fire, which was 15 percent contained as of Tuesday afternoon. Firefighters in Northern California continue to battle a pair of massive wildfires that together have charred more than 135,000 acres and destroyed more than 750 homes. At least one person, a 72-year-old woman, is known to have died. Cooler temperatures and moist weather were helping fire crews Tuesday as they tried to gain the upper hand on the Butte Fire in Amador and Calaveras counties, about an hour's drive from Sacramento. Officials say that fire was about 37 percent contained. The larger of the two blazes, the Valley Fire, threatens the counties of Lake, Napa and Solano and was 15 percent contained. The Valley Fire alone has consumed 585 homes and hundreds of other structures since it started Saturday. An additional 9,000 structures were under threat. The San Francisco Chronicle reports the Valley Fire started off small, but took just a few hours to destroy 40,000 acres. "Thousands of residents remain stranded at evacuation shelters after 100-foot flames tore through the peaceful communities of Middletown and Cobb on Saturday evening, wiping out entire neighborhoods and destroying livelihoods. "Some of those evacuees will be escorted back into the fire zone for the first time Tuesday morning to gather any pets and livestock that may have survived when the fast-moving wildfire surged through." The woman killed in the Valley Fire over the weekend was identified as Barbara McWilliams of Anderson Springs, a community near Middletown. She reportedly had multiple sclerosis and had no way to get out of the fire's path. The Lake County Sheriff's Department issued a statement saying that deputies tried to rescue McWilliams but weren't able to reach her in time. The Press Democrat spoke to her caretaker, Jennifer Hittson, who says McWilliams' last words to her were, "Someone will come." Meanwhile, officials said crews fighting the Butte Fire had more success Tuesday in maintaining perimeter control, but that dry conditions and difficult terrain were a challenge. "While firefighters are aggressively fighting the blaze, it is a tough slog because moisture levels in trees and bushes are so low. The tinder-dry brush quickly burns when the fire marches across the mostly rural landscape."